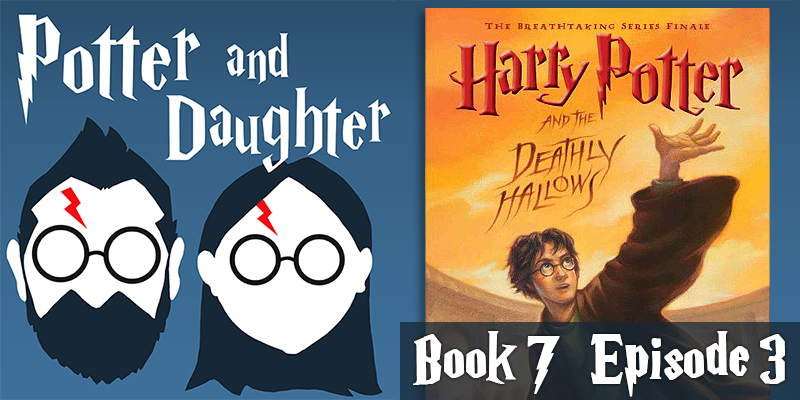 In episode thirty of Potter And Daughter Joel and Lily tackle Harry Potter And The Deathly Hallows chapters 14-19. Harry and his friends, with no safe haven to return to, are on the run. Harry learns that Voldemort is after a previously stolen item, and a possible method for destroying Horcruxes, but the victory is short-lived as, after a fight, the trio becomes a duo. Harry visits the place of his birth, and his parents’ death, and visits with an old friend of Dumbledore’s who isn’t quite what she appears to be. New information paints Dumbledore in a far different, darker light, but spirits are raised as a lost friend returns.